The third week of January, I was in Memphis, Tenn., where I was honored to receive the Blues Foundation’s 2015 Keeping the Blues Alive (KBA) award for Journalism and to be a finals judge at the 31st International Blues Challenge. It was quite a week. Receiving the KBA is a huge honor in the blues industry and the actual awards luncheon was an emotional one where the 15 recipients shared stories about how the blues had moved or motivated them. I am not sure that any other musical genre has that raw power. Memphis itself is an amazing city. If you have the opportunity to visit, I highly recommend starting your visit with Tad Pierson’s American Dream Safari. Pierson gives personalized driving tours of the city in his 1955 gold Cadillac. He’s been doing this for about 20 years. Being on a tour with Pierson gives you not only his unique insights into the history and culture of the city but some amazing opportunities. Pierson drives you past some of the city’s less iconic spots, like the public housing where Elvis Presley and his mother first lived, the boarded-up church where Martin Luther King gave his last sermon and a stop on the street where James Earl Ray fled from a rooming house after shooting King with the balcony of the Lorraine Motel nearly straight across the street from us. The Lorraine is now the home of the National Civil Rights Museum and the exterior of the Motel is permanently staged with vintage cars and other memorabilia as it was the day King was killed. We hit the street where the historic Royal Studios is located. Royal’s Willie Mitchell produced many of the classic Memphis soul sessions including Hi Records recordings of Al Green, O.V. Wright, Syl Johnson and Ann Peebles. The current chart-topping Mark Ronson/Bruno Mars track “Uptown Funk” was recorded at Royal too. See royalstudios.com. A young man out front saw Pierson’s Caddy and came running over with a “Hey, what’s up?” The next thing we knew we were being invited inside. The young man is Daniel Mitchell, one of Willie’s grandsons. Willie Mitchell continued recording and producing until his death in 2010. Daniel, age 16, proved to be a marvelous tour guide who understands and appreciates the historical significance of what his family has been doing at Royal. The studio is in a repurposed old movie theatre with sound pockets built into the space so that the various players can be isolated while they can all see and hear each other. 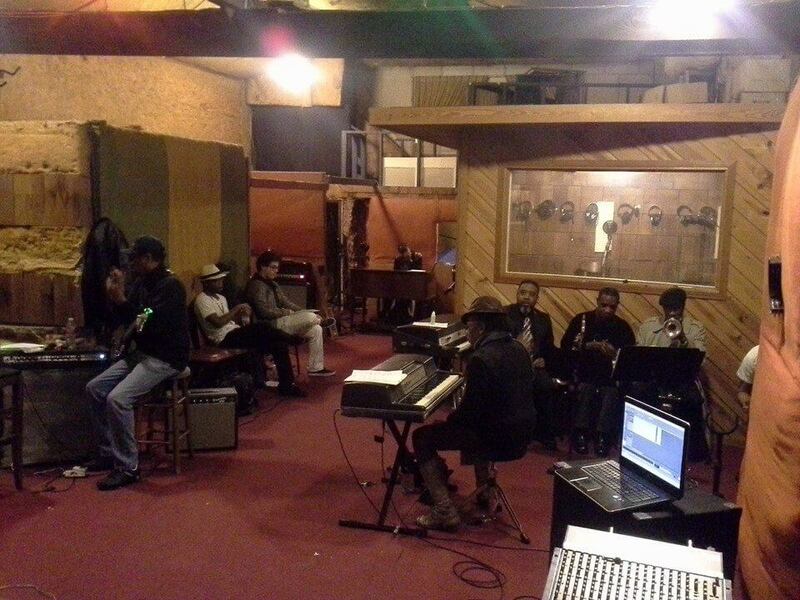 Inside, many of the old session players were gathered, rehearsing for their performance at the Sundance Film Festival. The film Take Me to The River, matching old school Memphis artists with young hip-hop and rap performers, was screening at Sundance. A live performance was part of the festival screening and the band also has gigs in Southern California, Brooklyn and at Harlem’s Apollo Theater. See facebook.com/tmttrfilm. Willie’s son Boo Mitchell was getting the session organized. In the room were the Royal horns featuring trumpet player Ben Cauley. Cauley was a member of The Bar-Kays and was the only man to survive the plane crash that killed Otis Redding and the rest of the band. Cauley also is featured in the documentary film. I shook hands with Charles Hodges, the Hammond B-3 master who has recorded with everyone from Al Green to Albert Collins and Boz Scaggs. It was really beyond belief to be walking around the studios where so much musical history was made and is still being made, and to be welcomed like old friends. Visit hoodoorootsblues.blogspot.com to see more pictures of our visit to Royal and Tad Pierson’s 1955 Cadillac. And that was just the first day of my stay in Memphis. Remember to check the weekly online column at thereader.com for more Memphis highlights and for upcoming show recommendations.